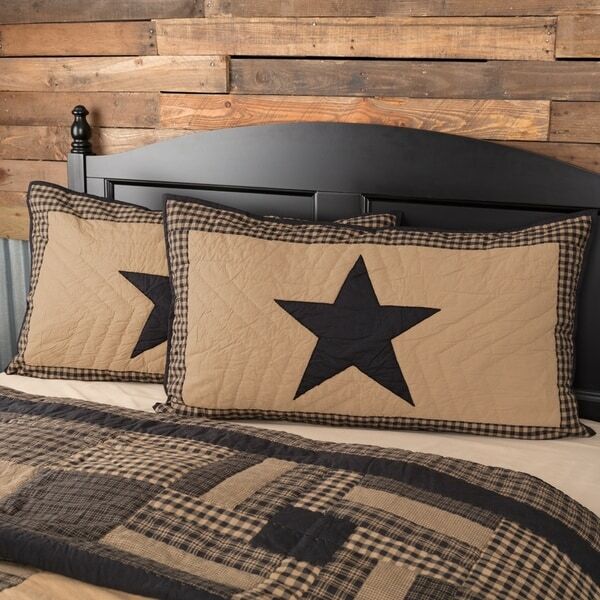 PATCHWORK: HAND-QUILTED: This pillow sham is hand-quilted and machine pieced. Dimensions 21.0 In. X 27.0 In. This is beautiful and the quality is seen in each stitch! I got every piece to match♡ I recommend this set! these pillow covers are high quality and the colors are perfect for my primitive decorated bedroom, I am very pleased with the style and the quality, and I would purchase them again. These shams look as beautiful as the matching quilt. The material is very good quality and they look great on the bed. I received my sham and I love the looks of it and it seems to be made of very good quality and that's important to me. I would recommend this to a friend. I have enjoyed shopping with Overstock and so far I have really liked everything I have purchased from them. Made very well, well worth the price, yes, I would recommend this to a friend or family member. Goes very well with the vhc raven quilt. Would purchase again!! I really like the matching king-size shams. Well made! Im in love with the shams. I love the primitive stars, it's so cheery! Quality made! I bought it to match the entire bedroom.